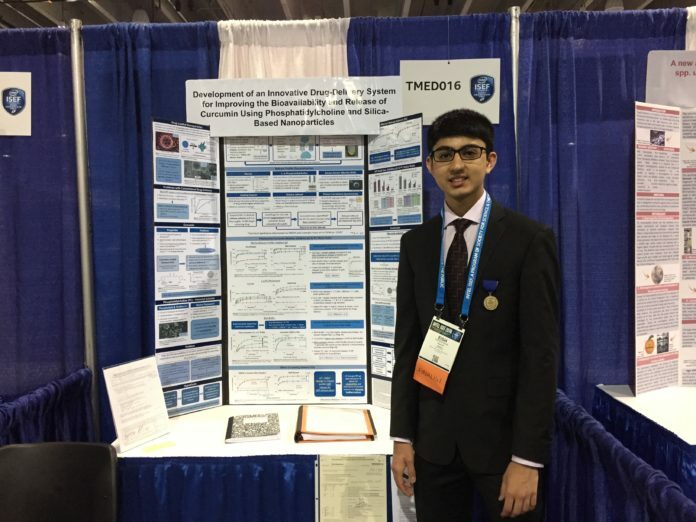 Herricks High School junior Eish Maheshwari earned two awards at the 2018 Intel International Science and Engineering Fair. Maheshwari went too the event in Pittsburgh with Science Research teacher Renée Barcia. Maheshwari has received the Grand Award, fourth-place, in Translational Medicine with a $500 prize and a special award from the University of the Sciences in Philadelphia with a $9,500 scholarship for four years if he chooses to attend the school. He presented his research project, “Strategies for Tuning the Release Profile of Curcumin-Loaded Nanoparticles to Improve Drug Bioavailability and Optimize Sustainable Delivery,” to a panel of judges that are leaders in industry and research. At Herricks High School, Maheshwari has been mentored by Barcia since the ninth grade and worked with her to prepare for the challenging questions at this competition. He was also mentored by Dr. Joel Friedman of the Albert Einstein College of Medicine Department of Physiology and Biophysics. Maheshwari advanced to the 2018 ISEF after being recognized as a Long Island Science Congress Regional Finalist in April. He is also among only 14 Long Island entrants that qualified for the New York State Science Congress by achieving this distinction.